Here's an interesting way to serve zucchini that was posted by Raquelita in September 2006. The recipe is Zucchini Oven Chips, a breaded zucchini slice that is baked on a rack in the oven until crisp. Test one of the thick slices to make sure the chip is crisp before removing from the oven since oven temperatures vary. This looks like a good idea. I would probably go heavier on the garlic and add a few other veggies in the mix like maybe an eggplant and another type of zuchini. Yeah, some eggplant, yellow squash and even a nice meaty tomato are adaptable to this recipe. I made the recipe for this post and can say for certain that is really a tasty vegetable side dish. 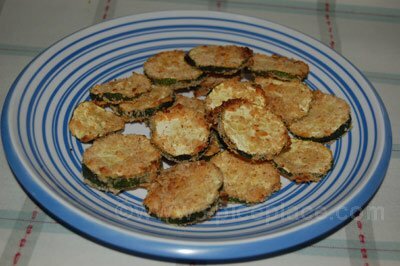 You've all heard of eggplant parmesan - so why not use zucchini chips?? Place a bit of sauce in the bottom of your baking dish/casserole, layer zucchini with cheese and sauce, top with sauce and sprinkle with a nice Italian blend of cheeses; 350 to heat through and melt cheese! A great side dish to serve with chicken or pork! Or try a nice mix of breaded zucchini, eggplant, tomato slices and crookneck (summer) squash with cheese (using a buttered/oiled casserole). Serve with spaghetti sauce drizzled over each serving. I'm thinking these would taste great dipped in an Italian seasoned tomato sauce.